Whitefield's Tabernacle Tottenham Court Road stands on the western side of the street, about fifty metres (yards) north of Tottenham Street. 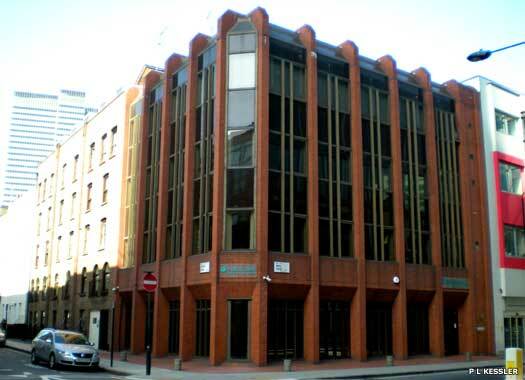 Also known as Tottenham Court Road Chapel, it was originally surrounded by fields and gardens. It was built in 1756 for George Whitefield, and enlarged in 1759 thanks to its popularity. 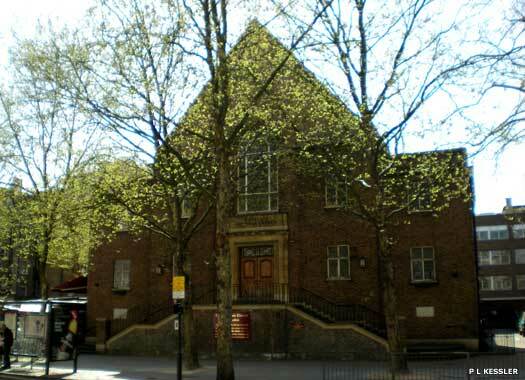 John Wesley preached a sermon 'On the death of the Rev Mr George Whitefield' both here and at Whitefield's Tabernacle Moorfields in 1770. In 1890 the building was re-erected as Whitefield's Central Mission. On Palm Sunday 1945 it was destroyed by the last V2 rocket to fall on London. The present chapel was built in 1957. 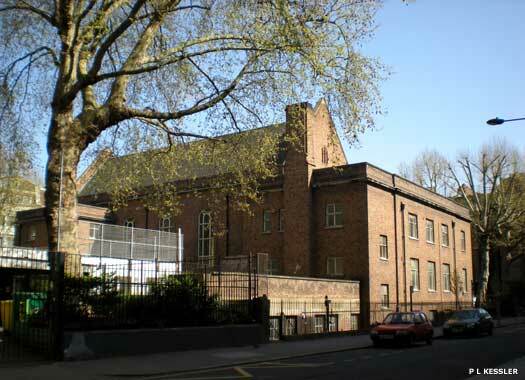 Since 1976, The American Church in London been based here, thanks to the loan of the building by the United Reformed Church, when they were forced to move from North Audley Street (close to St Mark's) in 1972. The London Chinese Lutheran Church also uses the building. St John the Evangelist Charlotte Street stood close to Fitzroy Square, near to the junction with Chitty Street, although precisely where is hard to pinpoint now. 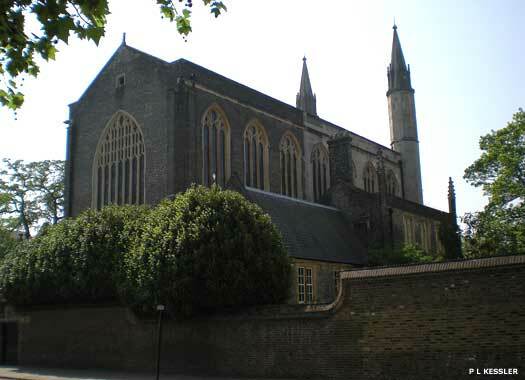 The church was constructed and consecrated in 1847 (or 1852), possibly beginning as Fitzroy Chapel. Also known as St John Upper Charlotte Street, from 1868 it was called Fitzroy Square St John. When it was demolished is not known, but in 1904 its parish was absorbed into that of its parent parish church. St Saviour London Street stood approximately at the junction of Maple Street with Fitzroy Street (although the corner of Whitfield and Maple Street is shown here). Also known as St Saviour Fitzroy Square, the church was completed and consecrated in 1865. As with a number of churches in this area of Westminster, it was closed and demolished early, by 1904, and its parish was absorbed into that of its parent parish church. No sign of it remains today. St James Hampstead Road stood on the eastern side of Hampstead Road, opposite the entrance to Robert Street. The church was consecrated in 1791 as a cemetery chapel for St James Piccadilly's 'new' cemetery farther out of town (as it then was). In 1864 it became a parish church in its own right, but was closed and demolished by 1954. 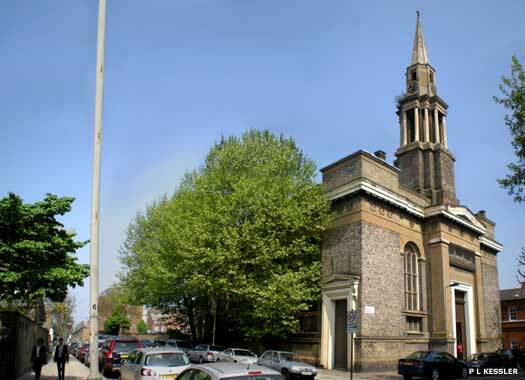 Its parish was united to St Pancras New Church. Much of the former cemetery grounds survive, as do a selection of tombs and markers. St Mary Magdalene Munster Square stands on the southern flank of Munster Square, and on the eastern side of Osnaburgh Street, where the street adjoins the square. This church was the last to be designed by R H Carpenter. It is rather square, built in pale ragstone, and contains a north spire. The site is cramped, in an area which has consistently been poor. Completed in 1852, the church was called 'the most artistically correct new church yet consecrated in London'. St George's Cathedral, Antiochan Orthodox Church is at the north-east corner of Albany Street and Nash Street, in the western section of St Pancras. 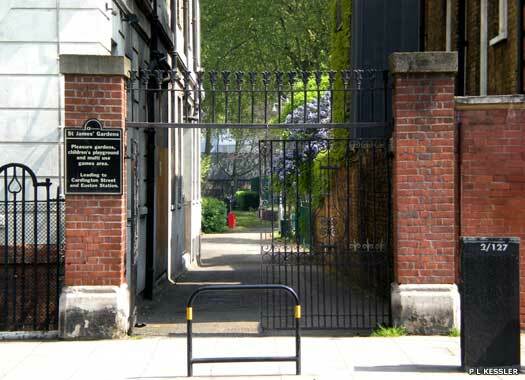 The building was erected in 1837 by the Anglican Church to serve the working class Cumberland Market district that was growing up at this time. 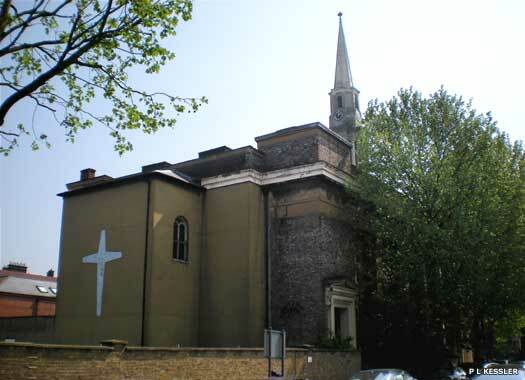 Opened as Christ Church Albany Street (Redhill Street), it was built by Sir James Pennethorne (1801-1871) with minimal exterior decoration and a comparatively small steeple. The church was patronised by Christina Rossetti, sister of Dante Gabriel Rossetti, for about two years, while she lived in Albany Street. 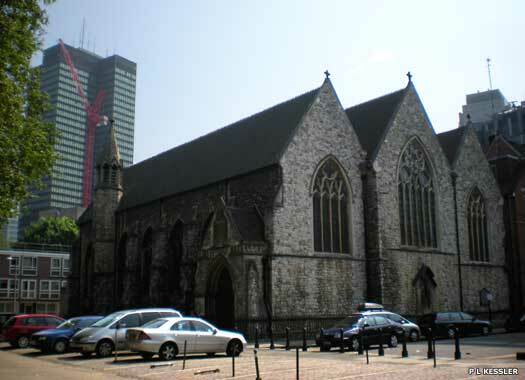 With church-going declining, Christ Church was closed in 1989 and its parish united to that of St Mary Magdalene Munster Square (see above). 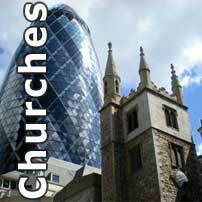 Soon afterwards the building was taken over by the Antiochan Church and given its present name, making it one of two such churches in London, the other being St Botolph without Bishopsgate. 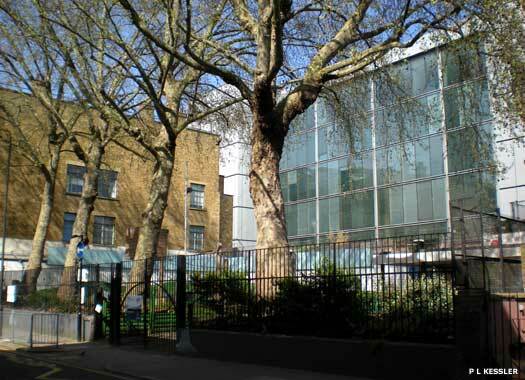 The Danish Church of St Katharine is at 4 Saint Katherine's Precinct, between Outer Circle and Albany Street, facing out over Regent's Park to the west and Park Village West to the east (shown here). 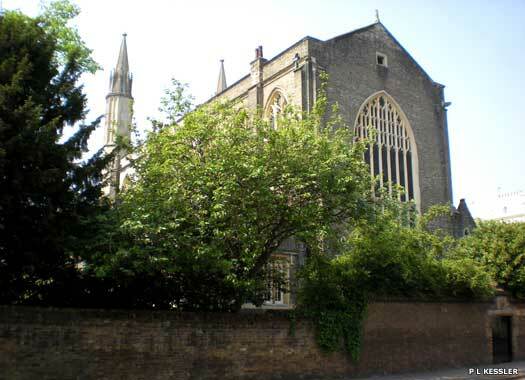 The first Danish church building in London was erected on Wellclose Square, east of the Tower of London, in 1696. The church moved to several different locations in subsequent years, finally settling at the Danish Seaman's Church in Foreign Harbours in 1867. This building remained open until 1985, but during the Second World War and in the years up until 1952, Danish services were held in the Swedish Church in Harcourt Street as well as in St Clement Danes. From that point both of the two Seaman's pastors worked at the Danish Church in Regent's Park: St Katherine's. The church was built in 1827 as a chapel and dedicated to Saint Katharine. In 1952 it became the home of the Danish Church and was thoroughly renovated.